Easy Post (---.2013) - Barcelona - International Regular Service. Complete sheet with 10 mint pre-paid tickets, international mail. Easy Post (---.2013) - Costa Blanca - International Regular Service. Complete sheet with 10 mint pre-paid tickets, international mail. 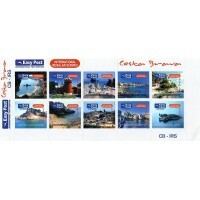 Easy Post (---.2013) - Costa Brava - International Regular Service. Complete sheet with 10 mint pre-paid tickets, international mail. Easy Post (---.2013) - Costa del Maresme - International Regular Service. Complete sheet with 10 mint pre-paid tickets, international mail. Easy Post (---.2013) - Gran Canaria - International Regular Service. Complete sheet with 10 mint pre-paid tickets, international mail. Easy Post (---.2013) - Instruments - International Regular Service. Complete sheet with 10 mint pre-paid tickets, international mail. Easy Post (---.2013) - Madrid - International Regular Service. Complete sheet with 10 mint pre-paid tickets, international mail. Easy Post (---.2013) - Mallorca - International Regular Service. Complete sheet with 10 mint pre-paid tickets, international mail. Easy Post (---.2013) - Tenerife - International Regular Service. Complete sheet with 10 mint pre-paid tickets, international mail.